Developed by the Editor in 2004, the Biomet Microfixation Chiari Plates have been used successfully in serveral hundred Chiari decompressions. 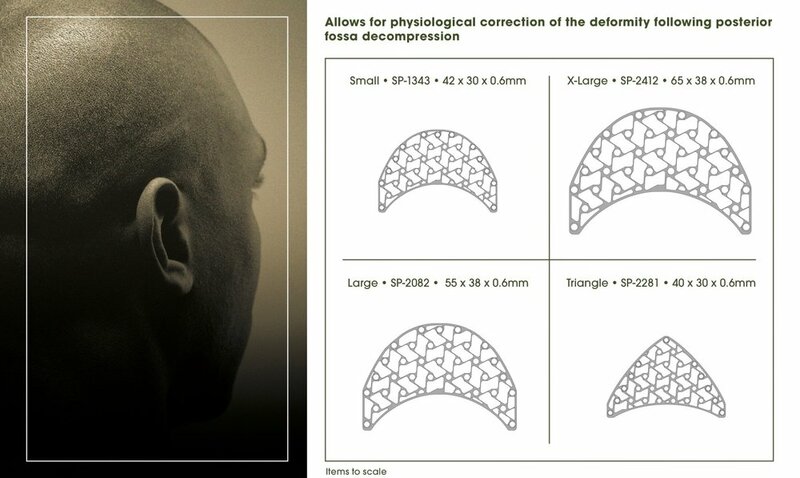 Available as Specialty Plates from Biomet Microfixation, the standard plates (used in 3 cm wide suboccipital craniectomies) come in a crescent and a triangular shape. Customized large and extra-large crescent-shaped plates can be requested from Biomet Microfixation and are used when surgical revision in needed in persons referred with wider craniectomies. Disclosure: The Editors have no financial relationship with Zimmer Biomet. Hover your curser over the right side of the image to see the next image, or over left side to see the previous image. Measuring herniation of the cerebellar tonsils (B) below the foramen magnum (A) is only the first step in radiological evaluation of the MRI.